Proper ventilation is imperative for a greenhouse to function properly. The ventilation system of a greenhouse provides fresh air to the plants (CO2), helps to control temperature and humidity, and reduces the likelihood of disease. 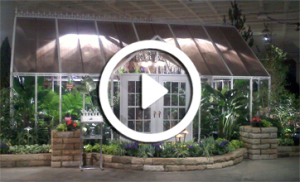 Greenhouses are generally enclosed structures that will not ventilate entirely on their own. In order to ensure that proper ventilation in the greenhouse is achieved, gardeners must install either a passive or powered ventilation system. A passive ventilation system is a ventilation system with no mechanical components. In other words, there are no powered fans involved with a passive ventilation system. Instead, the greenhouse is ventilated via convection (hot air becomes less dense and rises) through the ridge vents. In addition to the ridge vents, a passive ventilation system needs intake vents to allow cool air to enter the greenhouse and displace the hot air as it rises. These intake vents are generally placed on the lower portion of the side walls of a greenhouse. The largest advantage of passive ventilation systems is that they are virtually silent. This can be advantageous for a gardener whose greenhouse is attached to his or her home and the noise of a powered fan would be a disturbance. The biggest disadvantages of a passive ventilation system are cost, maintenance and efficiency. Most people may not realize that a ridge vent system will cost 3-4 times as much as a PVS (powered ventilation system). Also many people do not understand that maintenance is required with a passive ventilation system. The ridge vent needs to be kept free of debris and cleaned periodically. Also, the pistons on the vent system will need to be lubricated. Last, but not least, because air is not being forced through the greenhouse, a passive ventilation system is not as efficient as a powered ventilation system. All in all, passive ventilation systems are a great fit for greenhouses where the noise of a powered fan would be an annoyance. A powered ventilation system for a greenhouse is a ventilation system with a powered fan and intake vents. The cubic feet of the greenhouse space will be the determining factor for sizing a fan system. The minimum goal is to get the cubic volume of air turned over in less than two minutes. In many cases, a fan will be sized to turn over the air in less than one minute. A quick turnover makes it much easier to control temperature and/or humidity, keeping the greenhouse about 10 degrees cooler than a passive cooling system. The fan should be installed on the top section of the wall opposite of the intake vents and screen door. In other words, the intake vents should be installed on the same wall as the door and the fan should be installed on the top of the opposite wall. This ensures that the fresh air entering the greenhouse travels across the greenhouse before being evacuated. Powered ventilation systems are usually set up with a thermostatic control that will turn on the fan when the set-point temperature is reached. The intake vents are synced with the fan so they will open at the same time the fan is activated. In order to maintain the highest level of performance, the thermostat sensor should be placed at plant height. In addition to the cooling/exhaust fan of a PVS, a greenhouse should also be equipped with a circulating fan. Circulating fans provide continuous air movement within the greenhouse which helps to maintain uniform temperatures and humidity while also increases the structural integrity of the plants (much like the wind strengthens plants in nature). 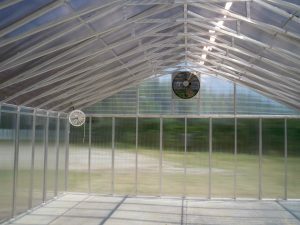 Greenhouses with circulating fans are the most effective and efficient for maintaining desirable atmospheric conditions. Whether you choose a passive or powered ventilation system, making sure a greenhouse is properly ventilated is crucial to creating an ideal growing environment for plants. A greenhouse’s temperature, humidity, and ambient CO2 levels are all determined by the ventilation system. 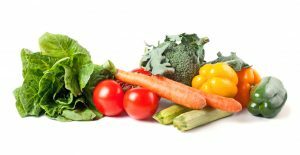 In other words, the ventilation system is one of the most important determining factors over the way plants will perform in a greenhouse and should be contemplated by every potential greenhouse gardener. For more information visit: www.ArcadiaGlassHouse.com. Call 440-357-0022 to speak with one of our knowledgeable horticulturists. Beautiful 14x24 Victorian style glasshouse with reverse gable entry. 2018 © All rights reserved. ArcadiaTM GlassHouse Inc.